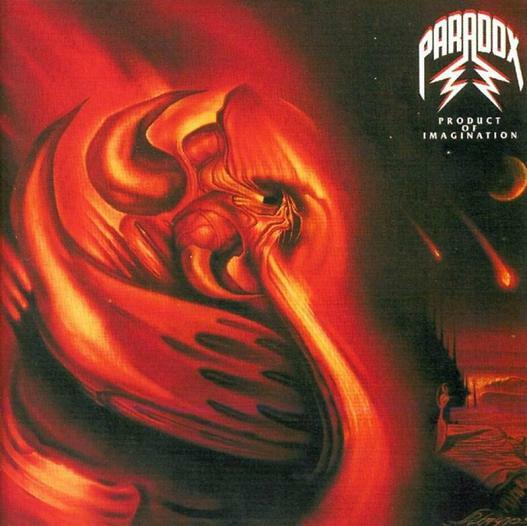 Paradox is a band quite a few people know, but not too many fully appreciate. The German outfit plays a mixture of speed and thrash, with tinges of power metal thrown in for good measure. All in all, Paradox is perhaps the greatest band in their genre, with few able to duplicate the consistent quality in their music. No collection of artists had been able to match such top-notch efforts in modern times, at least not for more than one or two albums. The legacy of Paradox began in 1987, with Product of Imagination. The first attribute of note is the antiquated production values. While not horrible, the overall sound dates the recording to the time period. It should be noted; however, that Product of Imagination has a pretty solid mix. The vocals don’t overpower the rest of the music and the bass can be heard reasonably well throughout. One point of contention is the solo work, which is slightly too loud in comparison to the rhythm section. Paradox’s debut was not flawless in the sonic sense, but the engineer got the point across well enough. In a most cliché fashion, the album begins with an instrumental introduction. Slowly, the volume increases and the listener is taken to a time when thrash ruled the world. “Opening Theme,” serves only one purpose: anticipation of the forthcoming hurricane. When the first track; “Paradox,” kicks into gear, the wait is over. Unlike a number of their contemporaries, these Germans seem more interested in high-velocity melody than brutality. The riff on the opening track has as much in common with early Helloween, then it does with one of the band’s primary influences: Metallica. Variety is the key to the album’s success. The songs are played at different tempos, from mid-paced to frantic. At the same time, each track takes the listener on an adventure in terms of general feel. “Death, Screaming and Pain” is restrained in tempo, yet ominous, with gang vocals accenting the classy guitar tone. The title track begins with an acoustic intro; then cuts like a razor with an array of speedy riffs, before trapping the listener inside an almost catchy chorus. The combination of aggression and melody is a feat, few bands are able to accomplish well (Seven Churches is another example, though the debut of Possessed doesn’t sound anything like Product of Imagination). Paradox offers a galloping tribute to Metallica’s “The Four Horseman” on “Kill That Beast,” but the song has an identity of its own. It is often difficult for a band to honor their influence without blatantly copying them, yet Paradox managed to pull it off extremely well. “Pray to the Godz of Wrath” is the finest example of the band’s ability to churn out fantastic hooks. The main riff sounds like something that could be found on a Stormwarrior album and the smooth, mellifluous chorus will stick in the listener’s head for weeks. The genre-bending flow of the entire album is worthy of veneration. The musicianship on Product of Imagination is solid, though couldn’t be described as technically impressive. Charly’s voice is among the best of the genre. He combines proficient singing with the occasional snarl or scream. The guitarists (one of which is Charly) never fail to impress in the riff department; however, the leads leave a bit to be desired. While not as bad as the atonal mess spat forth by Slayer’s axe duo, Paradox solos straddle the line between adequate and distracting. “Continuation of Invasion’ highlights some of the better lead work, in a fashion akin to Van Halen’s “Eruption.” The bassist appears competent and the drummer is not particularly imaginative, though his patterns fit the music perfectly. Song craft is what matters most and Paradox has no issue with providing. My complaints about this album are minimal. Apart from the previously mentioned limitations of the lead work, “Wotan II” is pretty much worthless. The eighteen-second outro contains needless, vocal chanting: basically, that’s it. Minor qualms aside, this album is a classic example of speed/thrash being played with style. Product of Imagination is highly recommended.